Here's where I wished I had a better camera. On the lower arm of this pole are actually three light green Hemingray No. 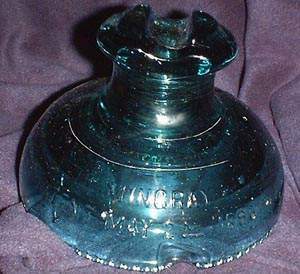 19 insulators that are still in service. I was unable to get close enough to determine the exact embossing. 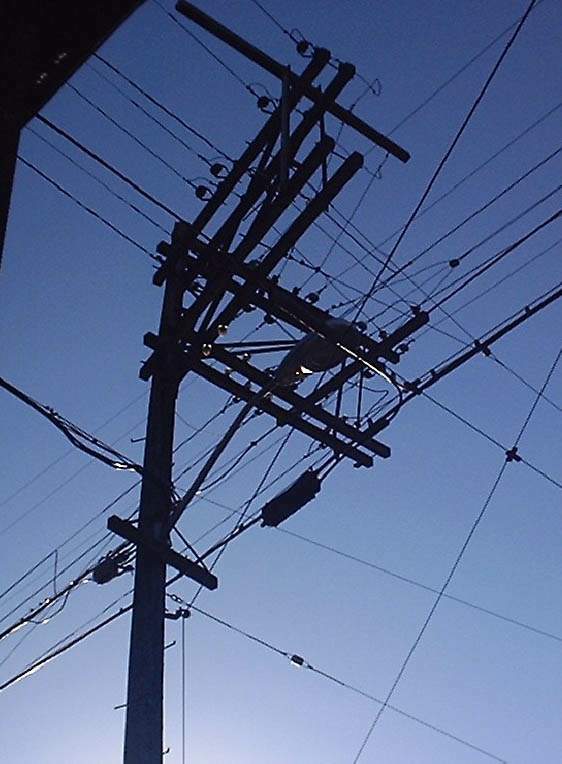 This pole is located at the intersection of Bellevue Ave and Pine Street, in Seattle's Capitol Hill. Another trip to the location (with binoculars) is needed to find out exactly what embossing variation they are. Along Crawford Place between Pike and Pine just east of Seattle, this pole (marked to be removed) seems to have a bunch of clear and light green CD164's (I think Hemingray or H.G. Co.) on the lower arms. A few of the insulators on this line seem to be Hemi 42's in clear as well. They are insulating the low voltage (110/220 volt) lines coming from the pole pig. And this one, at the intersection of Crawford Place and E. Olive Way. Note the two clear Hemi 42's mounted upside down on the northeast-facing lower arm. Squeak! A pair of Hemingray-60 Mickey Mice in the grass at a nearby park. Bill Meier deserves the big "Thank You" in this case. No need to leave you all guessing. These are the normal-groove style (number 60). Here is a true cobalt blue signal, in this case, a Hemingray No. 19. This example has an exceptionally bright, vibrant medium cobalt color. 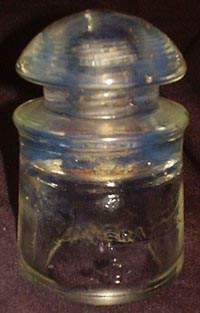 Many examples of this insulator in this color tend to have a dull, dinghy or dirty appearance to them, but this is about the clearest, cleanest one I have ever come across. Here is another relatively uncommon insulator: a CD128 Hemingray E_14B in light opalescent. 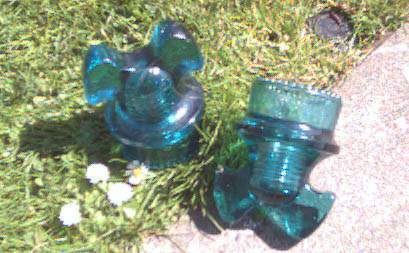 This insulator is rather difficult to photograph very well. Too little light, and the opalescent is not seen - too much light and the whole insulator washes out. Background too light? Same problem. For this picture, I used a dark colored garment as a backdrop, and covered the camera's flashtube with a white grocery store receipt to diffuse and attenuate the flash. It took several tries to obtain an acceptable picture that shows the light opalescent character, which is most noticeable in the dome & just below the wire groove in this specimen as a milky inclusion deep inside the glass. From what I understand, a lot of these are found in Florida at the bases of poles or buried in shallow graves near old poles. As a result, the glass (a distant cousin to Fry glass) is often eroded and pitted from the acid soil, but this specimen seemed to avoid a lot of that kind of damage. On the right is a crystal clear Hemingray-60 (CD257), known popularly as the Mickey Mouse insulator. This particular mouse has the less common "wide groove" or "wide ear" variant; in which the cable saddle on top is wider and has a flat surface. 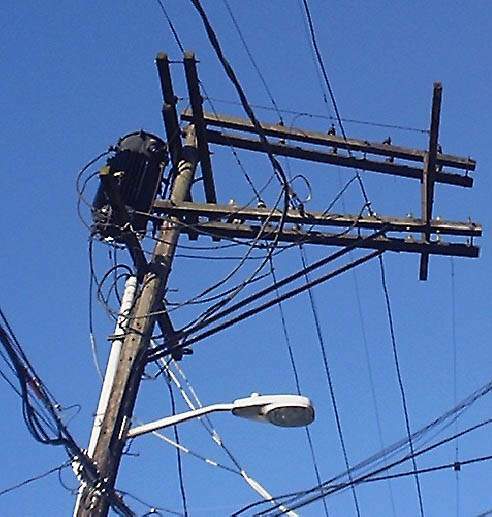 The difference between this and a "regular" Mickey is substantial enough that even a casual observer who knows nothing about insulators can tell the difference. 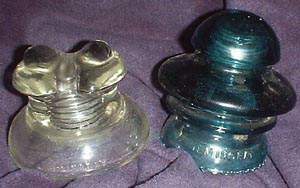 On the left is a Hemingray 512, (CD230) known affectionately as the Frog Eyes insulator. 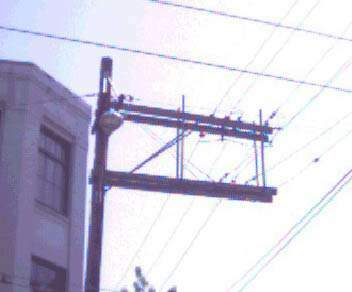 This is a fairly common power insulator, and it has the corrugated base characteristic of more modern Hemingray products. On the right is a Hemingray 53 (CD202), the insulator that ICON (Insulator Collectors On the Net) uses as their logo. This insulator is also not too hard to find, nor very expensive. You should be able to find these for under $5 apiece. Here is a less common Hemingray piece, a CD302, often referred to as the "Baby Muncie" because of its resemblance to the top half of a CD303/310 combo. Unlike the regular Muncie, this guy does not come with a sleeve, and is meant to be used by itself on the crossarm. 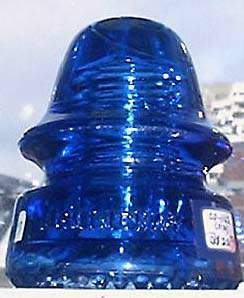 Large insulators like this are used for high voltage power transmission & distribution lines, not telephone, telegraph, or signal wiring like many of the smaller insulators you see on these pages and on poles in your area. Expect to pay $30 to $50 for one of these things if your collection needs a Baby Muncie to go along with your true Muncie Combo.